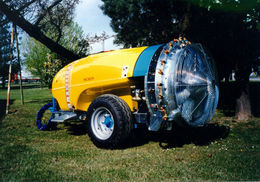 The Micron X-1 is a spinning disc rotary atomiser designed to allow the Controlled Droplet Application (CDA) of insecticides and fungicides on airblast sprayers. 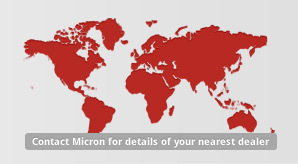 The Micron X-1 offers huge savings compared with hydraulic nozzles. By efficiently producing only the spray droplet sizes appropriate for insecticide and fungicide application the Micron X- 1 cuts spray volumes and costs and minimises any risk of environmental contamination. The air-driven Micron X-1 has been developed for mounting on air- assisted spraying machines. It is used on vehicle trailed or mounted machines for tree and bush crops in both tropical and temperate agriculture, and is also available as an attachment to retrofit knapsack mistblowers (the Micronex). The unique disc design and liquid feed mechanism of the Micron X-1 ensure controlled spray atomisation over a wide range of liquid feed rates in a compact atomiser. The Micron X-1 can be mounted straight onto existing standard nozzle bodies. Total application volumes using the Micron X-1 are generally 20 to 200 litres/hectare. These low volumes allow the economical use of non-volatile liquids (e.g. oils) as additives or carriers to reduce spray droplet evaporation, which, combined with the good control of spray droplet size, minimises any risk of uncontrolled spray drift. The Micron X-1 can be used with both water and oil based sprays. The spray droplet sizes produced by the Micron X-1 are between 35 and 150 micron, depending on the disc rotational speed and liquid flow rate. The low application volumes using the Micron X-1 mean greater areas can be sprayed per tank load (or lighter vehicles used), with dramatic savings in the cost, time and effort of the spraying operation. This both speeds up the spraying process and allows more spraying days. The Micron X-1 thus allows quick and cost-effective pesticide application to be undertaken when needed.